No data, no charge! You only pay if we get your data back (except for deleted file recovery). We use software and hardware based methods for getting your data back. A successful recovery is considered 99% of the hard drive, or if we get less than 99% we will let you know what we were able to get back and you can decide if it is worth the recovery total or not. 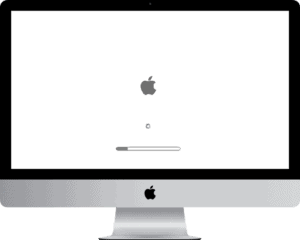 If your computer gets folder with a flashing question mark, or the Apple logo comes up but the spinning wheel just spins and spins and your computer never starts, or if the computer boots a circle with a line through it (popularly referred to as a no-smoking sign), your drive may just require level 1 recovery! All these symptoms can also require level 2, but the majority of computers with these symptoms we are able to recover with level 1 recovery procedures. 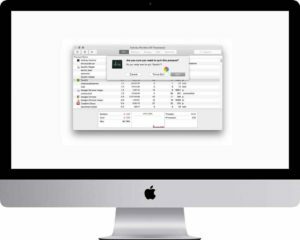 If we are not able to recover your hard drive with our level 1 service, your drive may require a Level 2 recovery. Level 2 recovery costs between $300-$500 depending on your drive and the issue with it. We will provide you with an exact quote after we diagnose your drive. If you are too far away to drop your computer or drive off for data recovery, you can ship it in to us and we will complete the recovery and send it back! Please use the service below to send us your computer for data recovery. We will start with a free diagnosis to see if your drive requires a level 1 or level 2 data recovery. If it requires a level 1 recovery we will continue with the recovery and send you an invoice for the $150 level 1 service as soon as it is complete. If the drive requires level 2 recovery, we will request your permission to continue with the attempt at the level 2 price of $300-$500. If you approve the attempt and it is successful we will send you an invoice for the level 2 service. The level 1 data recovery process takes anywhere from a couple hours to a couple days depending on the drive we are recovering from, and the amount of data we are attempting to recover. Level 2 data recovery takes between 4-8 days on average. Here are a description of some symptoms that can be a sign that your hard drive is failing and you may need data recovery. 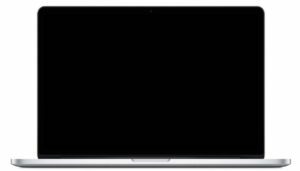 If you turn your Mac on and all you get is a blank white screen, it may mean your hard drive is failing or has failed. 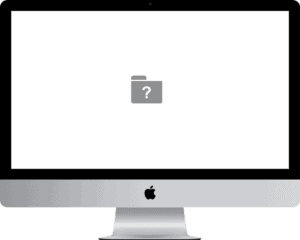 Normally if the computer can’t access an Operating System on your drive, it will display a flashing folder with a question mark… sometimes however, instead of displaying the flashing question mark, it endlessly seeks the drive that is not responding properly trying to find the OS, causing the screens monitor to stay a solid white. There can be other reasons for the monitor to stay white, and at EliteMacTechs we can tell you why after our free diagnosis! We provide data recovery services to Mac laptops and desktops that have the flashing folder with the question mark on the screen at startup. This symbol means the computer can’t find an operating system to start up off of, so either the OS is corrupt on your hard drive (software fix), or your hard drive has failed (possible physical issue). Sometimes a sign of a failing drive is if you get the spinning beach ball constantly. 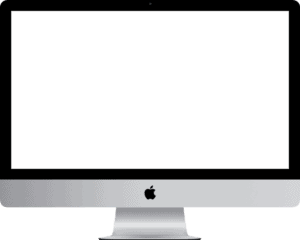 The spinning beach ball comes up on a Mac computer when the Mac is waiting for a process to complete. If a drive is failing, it can take a lot longer to access certain information off the drive, causing the spinning beach ball to come up. There are other reasons to get a spinning beach ball as well, and at EliteMacTechs we are pros at figuring out what is causing the hold up! When you turn the computer on and instead of the regular thin progress bar you get a larger progress bar that takes forever to complete, that can be a sign that there is corruption that is not being repaired on your drive. While this issue doesn’t necessary mean that your drive is failing, it could be the underlying cause of the corruption, and better be safe then sorry and bring it in for our free diagnosis. Another symptom that can be caused by a failing drive is that the computer instead of booting up normally will just continue to have a spinning cog endlessly. All these symptoms don’t necessarily mean you have a failing drive, but they can! So bring it in to us for our free diagnosis so we can narrow down what is causing the issue for certain. Do you have a couple programs that cause the computer to freeze for long periods of time or causes the computer to stop responding completely? These types of software issues can be caused by a failing drive (among other things). We can diagnose the issue for free and let you know all your options. When you turn your computer on and the computer gets through a certain amount of starting up, then shuts off, it could be a sign that your drive is failing. This normally occurs when their is corruption on the drive that the computer is trying to fix during the startup process, but when it can’t repair the corruption the computer shuts off completely. Bring your computer in for our free diagnosis so we can be sure what the issue is!